When I saw Tapulous’Tap Tap Dance appear in the App Store tonight, I didn’t get too excited. I’d played Tapulous’ first rhythm game Tap Tap Revenge [App Store, Free] briefly, but never really got hooked by the original title. Tapulous followed up their popular free app with a Nine Inch Nails edition with officially licensed music. 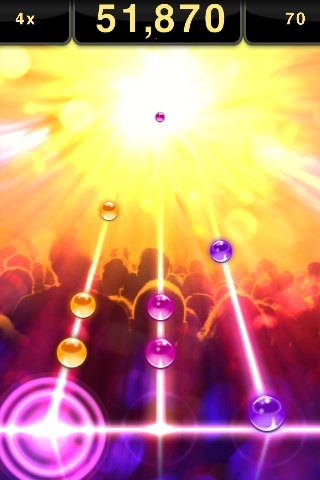 Tap Tap Dance, however, represents a more mainstream commercial followup to Tap Tap Revenge but with a new overhauled codebase which deliver some dramatic improvements in gameplay. As a result, Tap Tap Dance earns its $4.99 price tag. In a moment of serendipity, I was able to briefly speak with Kyle Kinkade and Mark Johns of Tapulous last night about their new game. Needless to say, they were very enthusiastic about their new game engine, and they should be. The game engine itself is described as a brand new codebase which incorporates the use of OpenGL to provide a more immersive gameplay experience. The flexibility of the engine is best demonstrated with use of themed “boss levels" which are unlocked at the end of each difficulty level. These boss levels incorporate custom themes which take the game beyond your standard view of a rhythm game and into something more hypnotic. Johns said their goal was to create a hybrid music video and gaming experience which reminds me of the feeling I’ve only previously had while playing the Dreamcast’s Rez. These themed levels offer a more abstract and immersive experience than the traditional tapping experience. I’ve included video of the first (of four) “boss level" in the embedded video below. The new engine also incorporates some long requested features such as multi-touch and tap-and-hold steps. These additional features are layered into songs as the difficulty levels increase. This video shows a normal level (medium difficulty) and the boss level (easy difficulty). The OpenGL effects of the normal level aren’t well captured on video. And the shaking/tilting movements were difficult to perform while filming, which explains why most of those were missed. An official trailer is also available. Fans of this genre of music should particularly enjoy this title, which we certainly recommend. If you really are not a fan of electronic music, then you may want to wait for the Christmas with Weezer version of Tap Tap Revenge which is due for the holidays. Tap Tap Dance takes iPhone rhythm gaming to the next level with its unique themed levels. The new game engine and licensed tracks add a great level of depth to the game. Fans of this genre of music should particularly enjoy this title, which we certainly recommend.